During the Millennium Development Goal (MDG) era, many countries in Africa achieved marked reductions in under-5 and neonatal mortality. Yet the pace of progress toward these goals substantially varied at the national level, demonstrating an essential need for tracking even more local trends in child mortality. With the adoption of the Sustainable Development Goals (SDGs) in 2015, which established ambitious targets for improving child survival by 2030, optimal intervention planning and targeting will require understanding of trends and rates of progress at a higher spatial resolution. In this study, we aimed to generate high-resolution estimates of under-5 and neonatal all-cause mortality across 46 countries in Africa. We assembled 235 geographically resolved household survey and census data sources on child deaths to produce estimates of under-5 and neonatal mortality at a resolution of 5 × 5 km grid cells across 46 African countries for 2000, 2005, 2010, and 2015. We used a Bayesian geostatistical analytical framework to generate these estimates, and implemented predictive validity tests. 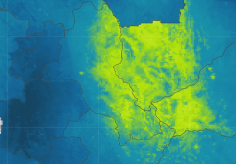 In addition to reporting 5 × 5 km estimates, we also aggregated results obtained from these estimates into three different levels – national, and subnational administrative levels 1 and 2 – to provide the full range of geospatial resolution that local, national, and global decision-makers might require. Amid improving child survival in Africa, there was substantial heterogeneity in absolute levels of under-5 and neonatal mortality in 2015, as well as the annualized rates of decline achieved from 2000 to 2015. 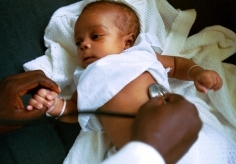 Subnational areas in countries such as Botswana, Rwanda, and Ethiopia recorded some of the largest decreases in child mortality rates since 2000, positioning them well to achieve SDG targets by 2030 or earlier. Yet these places were the exception for Africa, since many areas, particularly in central and western Africa, must reduce under-5 mortality rates by at least 8.8% per year, between 2015 and 2030, to achieve the SDG 3.2 target for under-5 mortality by 2030. In the absence of unprecedented political commitment, financial support, and medical advances, the viability of SDG 3.2 achievement in Africa is precarious at best. By producing under-5 and neonatal mortality rates at multiple levels of geospatial resolution over time, this study provides key information for decision-makers to target interventions at populations in the greatest need. 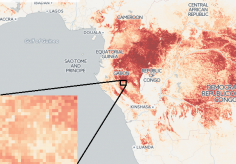 In an era when precision public health increasingly has the potential to transform the design, implementation, and impact of health programs, our 5 × 5 km estimates of child mortality in Africa provide a baseline against which local, national, and global stakeholders can map the pathways for ending preventable child deaths by 2030.